To tell stories is an old custom of the human race. And since the 60’s, Rock bands used their albums to tell amazing tales, being based on real facts or just fantasy. But the lyrics are just a part of what a band has to say, and honestly: without a strong and good musical work, the lyrics are worthless. But a band that uses an excellent music to shape their stories is the German quintet BLACKDRAFT, from Hamburg, that gives to the world “The Quest”. Their music is based on a German and modern form of traditional Heavy Metal, but with some excellent melodies from Power Metal. It’s not the most original musical formula of the world, but the way they play it is personal. The use of contrasts of tunes on vocals is a very good idea (from female melodic ones to harsh voices and some grunts), along with charming melodies, excellent guitars and a solid work from bass guitar and drums. Some keyboards parts were done by the special guest Niels Löfﬂer from ORDEN OGAN. It can be said as a very good work, without being something new. On the sound quality of the album, to catch the both aspects of their work (the silky aggressiveness and the melodic and technical parts) is not so simple, but it was done in a very good way. “The Quest” sounds clean, heavy and aggressive as it must be, and the choice for the instrumental tunes was done wisely, because they can sound aggressive, but always in a way that can be understood. The album has 15 songs, being four of them incidental instrumentals to be used as introductions. In reality, 11 songs, those that listed as “chapters”, are real songs, used to tell the story of researcher Runa Ágústsson (from Hamburg), who sets off for Iceland to start a journey into the deep sea from there, with some fantasy elements. And the best songs of “The Quest” are “Chapter 01: The Calling” (charming melodies and excellent contrast of voices), “Chapter 02: The Struggle” (excellent guitar riffs and solos, along with another fine balance between clean vocals and guttural grunts), “Chapter 03: Motivation” (accessible harmonies, excellent chorus, and a great work from bass guitar and drums on the tempos), “Chapter 04: Capsule” (another song with accessible melodies, but using a bit more from contrasts between clean vocal tunes and harsh grunts), “Chapter 06: Leap in the Dark” (the aggressiveness’ level becomes higher without tearing apart the melodic outfit of the song, and what a lovely work from guitars once more), “Chapter 07: Discover Beauty” (a song build with tender melodies and a deeper feeling), and “Chapter 11: Death” (excellent dynamics between vocals and instrumental parts). But the entire album is excellent. 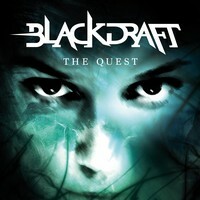 “The Quest” is a very good album, and BLACKDRAFT seems to have more to offer to the public. It’s just their second album, so the future seems to be great for them.